Olmec Heads – Where are they from? These are pictures of great Olmec heads from Mexico. Olmec Head in Mexican Civilization These are pictures of huge Olmec Heads found in Mexico. In the comments section, make one observation about the Olmec heads (for example: what is it made of? What is it wearing? Is is male or female?). Also, where do you think they are from: China, Europe, Africa, some other place. Take a guess if you are unsure. Both the Olmec heads are big. They both look like they are males. I think they are from Africa. i think they are from Europe. I think it’s made of stone. It is a male. I think they are from Mexico. My observation is that I think that these statues are from the Aztecs/indigenous people. I think this olmec head is made of a person.It seems like if it’s wearing a hat or something not sure what is called but something on top of his head.I think it a male.And I also think it comes from Hawaii. I think the thing is a guy and its and its made of stone i cant really tell if its wearing any thing but one of them look like it has hair i think it came from Europe. My observation about the pictures….well i think they are from AFRICA….there big…they look like if they were from AFRICA……!!!!!!!! i think it is made in clay too. I think they are made out of cement, or some specail material that has to take atleast 2 to 3 days to dry. i also think they come from Africa or Egypt. I think it come from Egypt because some how the face from the sculpture looks Indian or Native American. My opinion about this picture is that these heads are from Mexico. The helmet look like the type of helmet the warriers from Mexico used when they fought, i don’t know with who. Well I think that the pic looks ugly because it has a ugly face.The Olmen is one of the first cilivezation.They drived between 1200 to 400 B.C. I think the haed came from china becaus china make good stone want they hand. 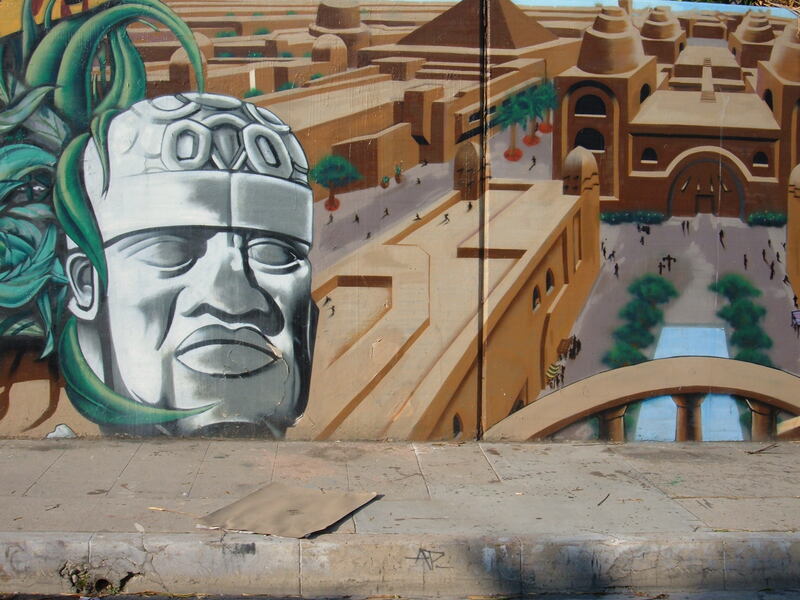 the Olmecs Civilization is one of the first civilizations in America. They thrived between 1200 to 400 BC and settled in the forest, savannas and rivers of the Gulf in Mexico. I think the Olmecs Heads are from Southern Varacruz and Tabasco. I think i heard about them being from there, so this is just a guess. wellll wat can i say, i think that they r made from china and i think dat it’s a MALE b cause it does’nt look like a female so that’s all i have 2 say. I Think The Head Might Be Made Of A Type of Stone. It Looks Like Its Wearing Some Kind Of Tribal Head Dress, And It Might Be From Africa…. IT LOOKS LIKE ITS MADE OUT OF STONE, AND ITS OBVIOUS THAT ITS A MALE. MY GUESS WILL BE THAT ITS FROM AFRICA, BECAUSE THEY HAVE A LOT OF STONES SIMILAR TO THE OLMEC. WiLL MY OPiNiON iS THAT THE BiG HEASD iS FROM MEXiCO&&THE HELMET LOOKS LiKE THE ONES THAT THE WORRiERS USED FROM MEXiCO..THATS MY OPiNiON..
UMM……. I THINK THEY ARE FROM EUROPE.CAUSE WHY DO THEY HAVE BIG HEADS?THEM ARE SOME BIG O HEADS!!!!!!!………. I THINK THAT THEY’RE FROM EITHER CHINA OR SOME PART OF AFRICA. ITS MADE OF ROCK AND THEY ARE FOUND IN MEXICO. I think that the head is from Egypt. I think that its from Egypt because there know for making things like that. I THINK THEY ARE FROM MEXICO!THE INDIGENOUS PEOPLE MADE THEM I THINK OUT OF STONE OR ROCK!THEY SCULPTURED IT!ITS LIKE THEIR GODS OR SOMETHING ABOUT THEIR RELIGION!THEY PRAY ON THEM MAYBE!I THINK THEIR LIKE MEN!ALSO PROBABLY MAYBE LIKE THE WARRIORS OR SOMETHING!SIMON!CAMARA! I really think this head is a symbol of a king I really think that mean somthing it could be somthing they worship every nite and the neal down to every nite your never know it could be one of the first kings or something. I think that the olmec are from ancient civilzation from the Mayan and I think they are a symbol from Mexico. what I think about the Olmec head,is that it is really big and its made out of stone or some kind of rock.I think the head came from a ancient area and it was traded to Mexico. 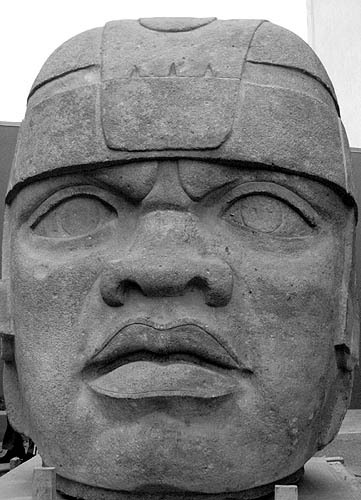 wHy ThE PEoPle oF MeXicO NeeD The OlmEc HeAh ..???? ?WhAt dOes rEpReSeNt .????? [[ I ThInK It rePrecEnT a gOd oR iMpOrtAnT PeOPlE tHaT DiE lOnG TiMe AgO …..
i believe that the amazing big head is a female…because of the lips..but it could be a male because of its features…the big heads is from Mexico…the big head is probably some kinda ancient king from long ago who brings good luck or something…people from long ago must of made it out of stone and dirt…i don’t know…but yeah!!! The Olmec heads are made of stone or clay.I think that it is a male,it comes from Africa.It is wearing a hat or something on its head to represent the culture. WELL WAT TO SAY……..LOOK LIKE THEY ARE MALES .MADE FROM MEXICO.LOOK LIKE THEY ARE REALLY OLD.LIKE AROUND 1200B.C TO 400B.C I AM NOT SURE. I think that if it came from Mexico then most likely it was made from clay. I think that they are males. It looks like they are wearing some type of helmet. i think it came from some ancient civilization. Maybe it was traded to Mexico. The pictures look like as if they were male warriors. one pictures looks like its made from stone.The other picture look like if some painted it as a mural . I think those 2 pictures were from people from Africa. I say that it was made in Mexico because long ago all of there sculptures were made out of rocks. I think it’s a male maybe an important symbol of a god or a great leader. It might be made of a special kind of rock . I’m very amazed by the features on the Olmec head.This is what I think about the Olmec statue. on observaton they look like guys and look like there from hawaii or something. one of observation is i think the head is of a male emperor. I think this work of art is from the mayan culture and from mexico. I believe the sculptures came from africa because i think its a important symbol. It is a man.I believe it is mayan.It is a god from the mayan culture. I THINK IS A FEMALE, I THINK IT CAME FROM AFRICA OR CHINA ONE OF THEM.I THINK THEY ARE MADE OF SOME TYPE OF HARD ROCK. I THINK THE BIG HEAD CAME FROM AFRICA CAUSE THEY MAKE HEAD STONES AND STATUES. i mean it looks hawaiian so i dont know …..
ii thiink thAT iit is made of clay or eiitheiir they sculputure iit out of rocks. iit iis a male for sure. plus they thiing that iits wearing iis probably sometiime of metal to supposly represent “protectiing the country. and ii thiink that iit came from chiina or europe. i think that the big head is made of some type of rock…and it also look like a male….and i think is from mexico….. I SAY THAT THEY WERE MADE IN AFRICA A LONG TIME AGO.ALL OF THESE SCULPUTURES ARE MADE OUT OF STONE.IT MIGHT BE A GOD THAT THEY PRAISED BECAUSE I SAW THESE KIND OF STONES BEFORE.AND IHEARD ALOT ABOUT THEM.I THINK THEY WERE MADE VERY DELICATELY .TAHT IS MY OBSEREVATION.I MENT TO SAY IT SOUNDS STUPID TO PRAISE A ROCK GOD SAID DONT PUT NOTHING BEFORE HIM LIKE NO ANIMALS,POSSESIONS,PERSON. i think these heads came from europe.The one that i was lookin at look like it was made from clay or somethin and it had a helmet on. that head looks big….maybe some ppl in the group had a big head….lol forealz…. well i think its from Hawaii because they have them big heads everywhere over them parts of town!!!!!!! that they are made in Mexico. one observation is that the stone statue is a male.I believe its from MEXICO. I see a big head made rocks it got eyes ,nose, mouth . I THINK IT IS FROM INDIA?????? i think the statue is male…an probably comes from Africa.. IT LOOK LIKE A MAN N HAVE A LOOKING FACE . I THINK IT COME OF SPAIN OR MEXICO BECAUSE IT WAS IMPORTANT .OR BECAUSE IT WAS FOUND IN MEXICO. I see a big head it has big lips ,big nose,and big eyes. I think it came from Africa. I think its from Africa or China because of the way it looks.It could be a woman that changed into a man. I think they are from Hawaii.They look like they were made a long time ago. umm…..i think they are from ROME because they are wearing those caps that the roman warriors wear and i think its a man and he’s made of stone. i think its made out of stone.and its a guy. my observation is… I think it a male because big eyes and big lips. I think it from… mexico?